Let's face it; the times have changed drastically in the last two decades. The Internet has evolved into a basic necessity. You need it for everything, for guidance, to order supplies, communicate, and for basic entertainment as well. In this guide, you will learn all about RV internet options, and the best way to stay online while on the road. What's the BEST Way to Get Internet Access while Traveling the US in an RV or Boat? Getting constant connectivity can be a significant challenge when you are always on the move. You will have access to power, no matter if you are on an RV or boat. The primary problem is in getting access to secure network or transmission signals. After all, when you are in a moving vehicle, wireless is your only option for any sort of communication. There are multiple RV internet options involving wireless communication technologies. And each method brings with it a fair share of challenges. If you want to stay online while in an RV or boat, you will have to learn at least some basics regarding these technologies. There are multiple factors that you need to take into account, regarding your own needs and limitations as well. How fast do you need the connection to be? Do you need uninterrupted signals? And even more importantly, can you afford that kind of service? What about the value for money aspect? These are all pertinent questions. And we will help you answer all of them in this guide. WiFi: short range and often available for free. But not usually available when on the road. Cellular: technologies like 3G and 4G. Has long range, but signal strength is dependant on cellular towers. Satellite: basically the "pie in the sky" option, often insanely expensive, but very reliable connectivity. The factor you have to consider while trying to choose the best internet option for you is mobility. How long do you plan to stay in one spot? Your work is much, much easier if you are going to be rooted in one place for an extended period. But the more consumed by wanderlust you are, the harder it becomes to stay connected. And let us not forget that in different areas, you might have to look for different internet options. So prepare to be flexible if you plan to travel a lot. In some locations, you might get strong 4g cellular signals right away. In others, you might need a booster. Some campgrounds offer free WiFi, but often with slow speeds or bandwidth caps. Connection speeds can also vary massively, from ponderously slow to blazing fast. 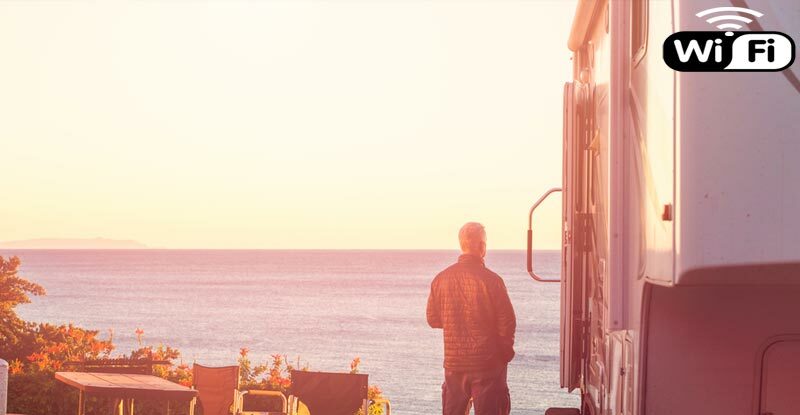 Even though there are three major internet options, the vast majority of RVers make do with combinations of two. These are cellular internet and public WiFi networks. Both these options are readily available in most populated regions and are relatively affordable as well. But in sparsely populated areas and out in the wilderness, you cannot rely on either of these options. If you plan to wander out into the middle of nowhere, far away from civilization, a satellite is often your only recourse. There is another option if you plan to put up camp on one site for an entire season. Some popular locations may have local wired cable/DSL connections that you can lease for the duration of your stay. But obviously, it is not really an option if you have to stay on the road. One thing is abundantly clear though: there is no single technology out there that guarantees connectivity everywhere you go. This is the easiest and most widely available option here in the US. For a vast majority of RVers, this is the core of their online connectivity system. With evolving technologies like 4G cellular data has come a long way in recent years, offering extremely fast connections when the signals are strong. When it comes to the cellular internet, you have to choose between cellular network providers. This is undoubtedly the cheapest way to get internet while RVing. There options galore as far as free WiFi is concerned. These include coffee shops, libraries, motels, stores, restaurants and breweries in urban and semi-urban areas. Some other options exclusively for RV and boat owners include RV parks and marinas. And you can even look for paid WiFi options with better speeds, because public WiFi is often horribly slow. It all depends on the quality of the connection used upstream for the WiFi network and the number of people using the network at any time. In urban areas, the upstream connection is usually modern DSL internet. But in remote areas, they might be using limited satellite connectivity or even plain old dial-up internet for their WiFi networks! For RVers who plan to frequent RV parks and campgrounds, urban options like coffee shops might not be practical. So in this case, you have to temper your expectations about campground and marina WiFi. Many sites prominently advertise "free WiFi," but in at least some instance, even something available for free is not worth the bother. The best case scenario when using these WiFi networks is that you can access your email and do some basic surfing. That is what most RV parks plan for. They simply do not have the infrastructure to provide high-speed WiFi for all guests. Satellite internet is pretty cool. You can get connectivity out in the middle of nowhere. And the signal is beamed directly to you, from outer space! But that kind of privilege comes at a considerable cost, and with some notable compromises. It is undeniably more expensive than the cellular internet. And you will need special equipment to receive the signal, your iPhone or Android device will not suffice. And to get connected, you might have to set up the equipment at each stop. Satellite is only worth it if you want to stay connected while out in the boonies. In almost every other case, it is simply not worth the time or investment. For RV owners, there are two companies with decent service: RVDataSat and HughesNet Gen 5. With some creativity, you might be able to source a working internet connection in several other ways as well. You have to force some redundancy if you want guaranteed internet access wherever you go. By this, we mean carrying along not just one, but multiple internet options everywhere you go. There is no such thing as overkill here. You could carry anywhere two to half a dozen different connectivity options. And still, you might end up with no signal somewhere out there. This kind of approach is more applicable to folks who depend on the internet for work and survival. There are two main aspects to the mobile internet: the cellular carrier, and the equipment you use to connect to the network. Here are some sample combinations, and their pros and cons, just to give you a rough idea of how effective mobile internet really is. The Mifi is a compact mobile Wifi network device that uses the cellular data signals from your Verizon connection to provide WiFi within your RV. It is completely wireless and is a self-contained package that requires no expert installation or setup. You will need Verizon network coverage for this device to work. This is often a good backup option since most of us have an iPhone or Android smartphone these days anyway. The pros are pretty much identical to what you would have on the Mifi. A notable disadvantage with the iPhone is the heating up and draining of battery when you leave it in hotspot mode for a long time. This is excellent as a tertiary option for unlimited WiFi, albeit at a slower pace compared to 4G. It may not be enough to watch TV shows in Full HD, but you can stream music non-stop on this setup. If you don't want to be tied down by annual contracts, carriers like AT&T have data packages available on a "pay as you go" format. This is a very flexible option, which you can combine with the RV Wifi extender from Winegard Connect. Smartphone vs. Hotspot: Which is Better for RVing? There is no such thing as one being superior to the other here. As we have already demonstrated in the examples above, they both work well, but for different types of internet usage. If you only have to consume low amounts of data, your smartphone and existing data plan should be more than sufficient. It is a good option for accessing email or connecting to Facebook now and then. A hotspot is only necessary and worth it if you plan to use large amounts of data, across multiple devices including a laptop or tablet. Your mobile phone also has a built-in hotspot function, so you might be wondering about the need to spend extra for a dedicated hotspot device. But that hotspot function on your iPhone or Android device is a battery hog. It will drain all the juice in a short time. If you want to connect other devices to your cellular internet, buy a dedicated mobile hotspot device. Verizon and AT&T may show uninterrupted coverage over much of the US map, but the ground realities may not reflect this. Don't put all your internet eggs in the basket of a single carrier. Keep a backup option or two lying around. If Verizon fails, you can always take a shot at getting network coverage from, AT&T or T-Mobile. Unless you plan to live out of your RV for a year, you shouldn't be considering an annual contract for your mobile internet. It doesn't make any sense to tie you down to a fixed contract. There are many hotspot devices available in the market with prepaid or pay as you go options. 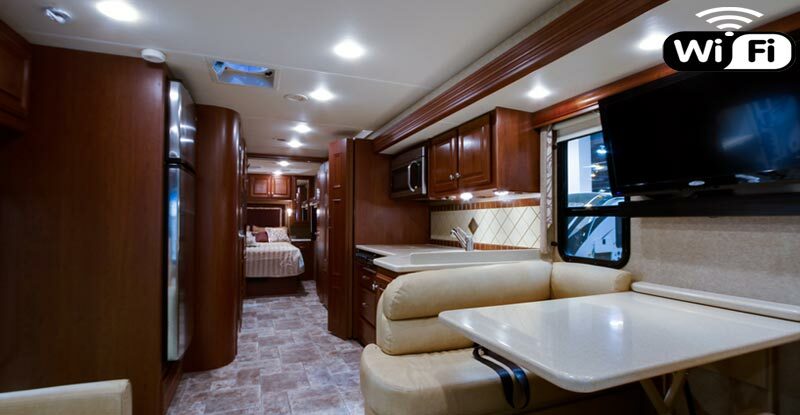 They may not have the coverage of Verizon, but they are very economical options for RVers. You should only be considering spending a lot on RV internet options if your livelihood depends on it. Spending a lot of money on the internet for entertainment is not a good idea in our opinion. RVing is all about the travel experience. Unless your paycheck depends on it, don't bother too much about the internet. That in a nutshell, is what RV internet options are all about. If you belong to the vast majority, you should be able to survive with a couple of cellular data connections and hotspots. But if you plan to head out into the deep wilderness, consider getting a satellite connection. Get at least one from everything if you plan to work out of your RV!